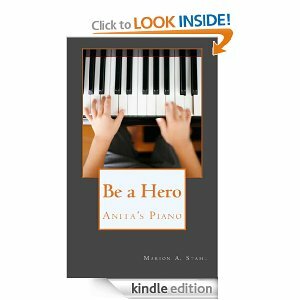 Be A Hero by Marian Stahl is a personal first-hand account of Anita Pollakova, a nine-year old Czechoslovakian girl, and how she, her family and others caught up in a world gone made endured. She details the events that took her from her home, where life was a happy mixture of family, friends, music and her dreams of what could be, to a work camp in Berlin. At the age of thirteen she volunteered to go to Berlin due to her mother’s insistence in order to save her life. By doing so, she had to leave her mother and her little brother behind in a camp in Auschwitz. She never saw her mother or little brother again. It was where she, and others older than her, worked for their own survival. She had labored in that camp for years praying for the Allies to free her. After British Troops liberated her camp, she heard that her father was alive and made arrangements to go to him. But she was too late. When she arrived she learned her father had died in a death march. Orphaned at fifteen she spent time in an orphanage and was later recruited to join the Zionists Underground Haganah Army and went to Palestine. She lived in a Kibbutz with her first husband and later moved to the United States where she raised her son. She intends to raise her grandchildren there as well. Heroes come in all shapes and sizes and in all ages, some from the Battlefields of War, others from the fight to survive. Anita Pollakova is a hero because she survived in spite of the degradation, brutality, humility, and inhuman horrors she, her family and others were subjected to through no fault of their own, but because a madman wanted to conquer to world.